Give your child a room that they will love spending time in with the Better Homes and Gardens Lillian Collection. Thoughtfully designed with hints of traditional styling, the Lillian Collection is versatile and perfectly suited for today's growing families. A comfortable and space-saving solution for friends and family that come over, the Lillian Twin Bed Trundle accommodates a twin size mattress. 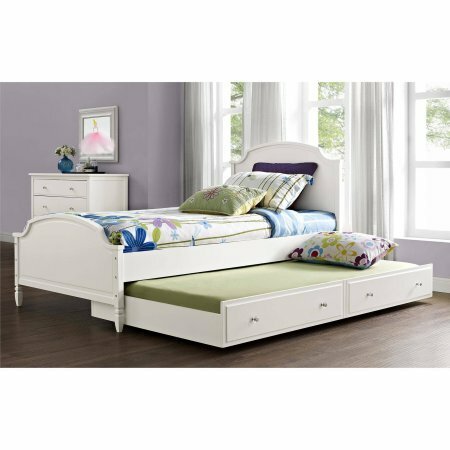 Easily stow away this trundle under the Lillian Twin Bed or Twin Daybed (sold separately) and wheel it back out for sleepovers or extra seating while playing. Alternatively, this functional trundle can be used without a mattress as storage for clothing, toys, blankets or pillows. The front panel mimics a two-drawer facade and is adorned with detailed Acrylic knobs. If you have any questions about this product by Better Homes & Gardens, contact us by completing and submitting the form below. If you are looking for a specif part number, please include it with your message.